← Fantastic Fotos Faster! – Fotobabble’s new release is available today! Fotobabble for Timeline takes full advantage of the larger real estate and provides your users an even better experience as they interact with your brand. Like gating pages, landing pages, galleries and photos are all more compelling than ever. Fotobabble for Timelines lets you feature exceptional content by creating full width posts in your newsfeeds and anchoring them to the top of your page – a great alternative to custom landing pages. Timeline lets you convert your newsfeeds into ads and offers. That means you can also convert photos and Talking Photos that are posted on newsfeed via Fotobabble for Timeline. For example, if you run a Talking Photo contest and one of your customers offers up a dynamite testimonial for your product. you can post that testimonial to your newsfeed. And you can also turn the Talking Photo into an ad. If you have any questions, call us and well show you how. 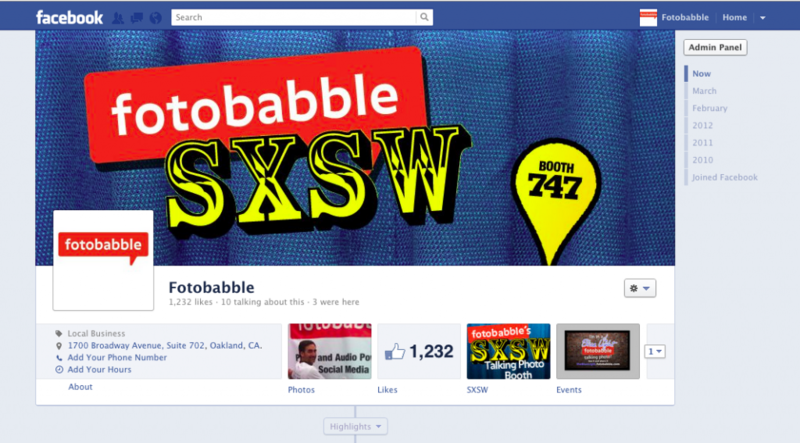 The new and improved Fotobabble for Timeline lets you install multiple Facebook tabs per brand page and run multiple photo contests or campaigns. Use one tab to showcase your products and services, another tab to promote content from a previous campaign and run a new contest all at the same time. So install Fotobabble for Timeline today and let us know what think. We’d love your feedback! This entry was posted in Fotobabble News, Product News. Bookmark the permalink.